We are delighted to renewal the full line up for our Bigger Birthday Bash at Stereo on 31/03/2018. 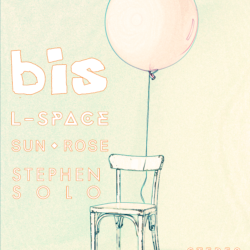 The evening will again be curated by Stephen Solo who will also perform, alongside Sun Rose, L-space and headliners Bis. It promises to be a absolute cracker and tickets are available via the ticket link above.